My Little Visitors | The world is better with you in it. Every morning I take my dog, Jolene, out to the back porch and brush her hair. She’s small, only 16 pounds, but sheds like a great Dane so I try to keep the majority of her hair outside to let nature take care of it. She likes the brushing because it gets her going. Like a good morning cup of coffee, the brushing wakes her innards up and before I finish with her she always jumps up with a big smile, runs down the porch stairs and heads to the back yard. It’s like magic. 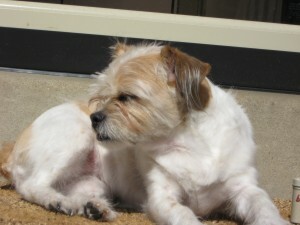 One early June morning the sun was shining, the breeze was cool, and Jolene was her usual ebullient self. She bounced around impatiently as I attempted to give her a thorough brushing, gave up on me after a couple of minutes and ran down the stairs to the back yard like she always does, and dashed right past a Morning Dove chick that was sunning herself on my patio. It took me a moment to notice the chick myself, as she was about the same color as my patio bricks, and I was surprised that Jolene, the expert bird chaser, had missed her. When I took my camera out to take a picture of her on my porch stairs, I could see why. 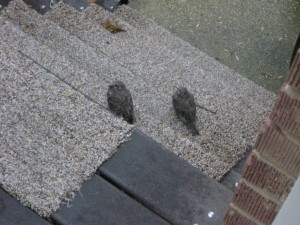 This is a picture of two chicks that I took with a flash. Can you see them? It made me wonder what animals see when they look at each other. These little doves were smart enough to know that they would camouflage with my indoor-outdoor carpeting, so they camped out there for days until they were strong enough to fly and stay in the trees. I watched mom come by every day to feed them, cooing and purring all day by my window. As long as they sat still, Jolene was nice enough to leave them be, probably because they were literally out of sight, so the chicks felt safe and comfortable. This is the same pic without the flash. What a difference! So trusting and fearless; they would just sit there and watch me as I got closer and closer with my camera. I felt I had made some new friends. With those big unflinching eyes and their quiet naive personalities they stole my heart. 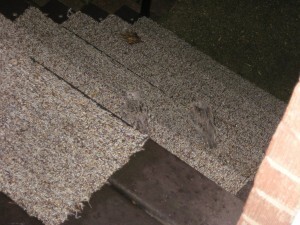 Even though they pooped all over my stairs I let them stay, safe and secure in my yard, hidden from all predators. And we have some pretty good predators. Between the hawks, fox, and neighborhood cats, these guys would make someone a great snack. Eventually they left, and they’d come back every other day or so to see what I was up to or spend the night on my stairs, but I knew that some day they’d leave for good. When they did disappear completely I sent them my blessings, because I know what’s out there in the real world waiting for them. Now that the weather is hot and dry the world is even more dangerous. I put bird seed in the feeder and replace water in the bird bath every morning and hope they get their share. Soon they’ll be starting their own families. 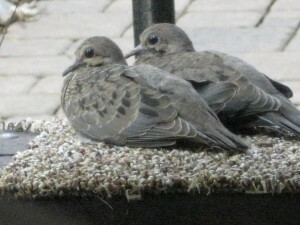 Maybe I’ll be watching some grandbaby-birdies grow up next year. I was planning to remove the indoor-outdoor carpeting, because I’d put it there for my aging scotty who is now gone, but I think I’ll keep it now. I like being a haven for growing babies.